• Average size 19 cm X 4.5 cm. 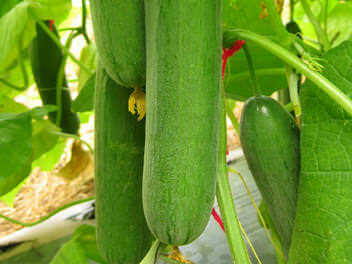 Al-Facoz/Feggous 60 Indeterminate 75 x 5 cm Curved Dark green, slightly corrugated Used also as pickle cucumber, popular in North Africa and the Middle East. Armenian Long Green 60 Indeterminate 90 x 10 cm Curved, ribbed White spine, light green Popular in the Middle East. For ethnic markets. Armenian Long White 60 Indeterminate 90 x 10 cm Slightly curved, ribbed Creamy white, slightly hairy For specialty markets. Harvest before maturity for a better taste. Ashley Imp. 60 Indeterminate 20 x 5 cm Tapered ends White spine, dark green DM Early variety and productive. Released by South Carolina. A.E.S. Popular in many areas. Beit Alpha 58 Vigorous plants indeterminate 15 x 5 cm Straight and smooth, slightly tapered Negligible spine, medium green CMV, MMV Also pickling variety if picked before maturity. 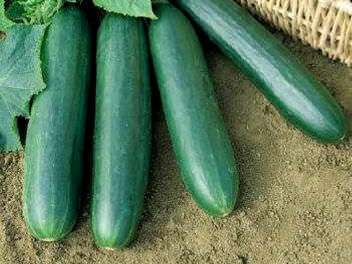 Mekty Green 65 Indeterminate 75 x 9 cm Slightly curved Medium green For special markets, also known as snake cucumber. Mekty White 70 Indeterminate 75 x 9 cm Slightly curved Off-white For special markets, may also be used as a pickling variety. Poinsett 76 65 Indeterminate 21 x 6 cm Blocky White spine, dark green Scab, DM, PM, CMV, ANT, ALS Improved Poinsett with added disease resistance. Straight Edge 65 Indeterminate, very vigorous 20 x 6 cm Blocky White spine, dark green, light stippling Very uniform fruit, an older but still popular variety. Table Green Select 75 Vigorous 20 x 6 cm Blocky White spine, dark green CMV, MMV, DM Very uniform, good keeper. 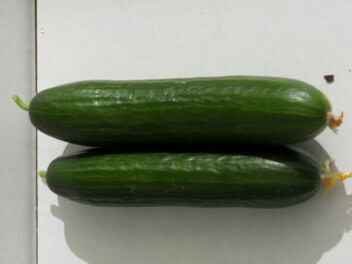 White Wonder 60 Vigorous 18 x 6 cm Cylindrical, round ends White Excellent eating quality, best for slicing. 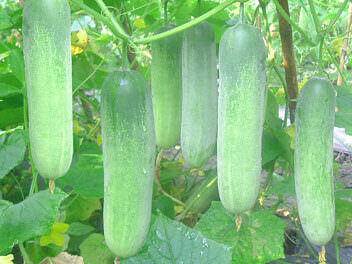 Marketmore 76 72 Very Vigorous 21 x 6 cm Blocky White spine, fruit dark green Scab, CMV, PM, DM Excellent disease resistance. Widely adaptable and very productive. Addis 56 Vigorous, indeterminate 7.5 x 2.5 cm Blocky White spine, dark green fruit CMV, DM, PM, ALS, ANT Developed by North Carolina State University. 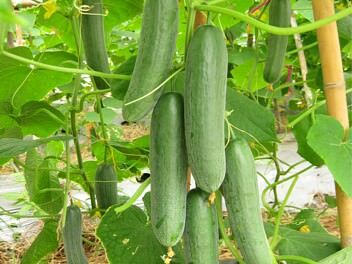 National Pickling 54 Vigorous, very prolific 15 x 6 cm Blocky Black spine, medium dark green CMV, Scab Noted for its very good pickling quality, uniformity and high yields. 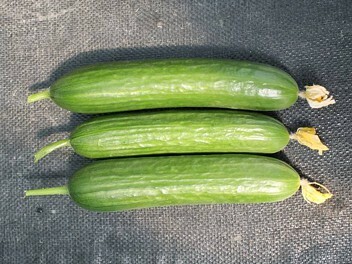 Wisconsin SMR-18 55 Vigorous 15 x 6 cm Blocky, free from tapering Black spine, fruit medium dark green CMV, Scab A disease resistant pickling variety. Widely adaptable. Wisconsin SMR-58 57 Vigorous, indeterminate 15 x 6 cm Straight and blocky Black spine, medium green CMV, Scab Released by University of Wisconsin. 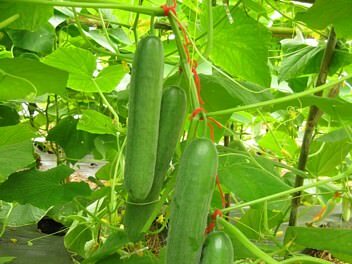 One of the most popular home garden varieties with excellent processing characteristics. Yuba City, California 95991 U.S.A.